“The sharing economy” refers to a constellation of (mostly) Silicon Valley–based companies that use the internet as their primary interface with consumers as they sell or rent services. Because this term is “vague and may be a marketing strategy” (AP 2019), we refer to these firms less poetically but more precisely as “internet-based service firms” (IBSFs). Economic policy discussions about IBSFs have become quite heated and are too often engaged at high levels of abstraction. To their proponents, IBSFs are using technological advances to bring needed innovation to stagnant sectors of the economy, increasing the quality of goods and services, and providing typical American families with more options for earning income; these features are often cited as reasons why IBSFs should be excused from the rules and regulations applying to their more traditional competitors. To skeptics, IBSFs mostly represent attempts by rich capital owners and venture capitalists to profit by flouting regulations and disguising their actions as innovation. The debates about whether and how to regulate IBSFs often involve theories about their economic costs and benefits. This report aims to inform the debate by testing those theories. Specifically, it assesses the potential economic costs and benefits of the expansion of one of the most well-known of the IBSFs: the rental business Airbnb. Airbnb, founded in 2008, makes money by charging guests and hosts for short-term rental stays in private homes or apartments booked through the Airbnb website. It started in prototype in San Francisco and expanded rapidly, and is now operating in hundreds of cities around the world. Airbnb is frequently depicted as a boon for travelers looking for lower-cost or nontraditional accommodations, and for homeowners looking to expand their income stream. But in many local markets, the arrival and expansion of Airbnb is raising questions about its potential negative impacts on local housing costs, quality of life in residential neighborhoods, employment quality in the hospitality industry, and local governments’ ability to enforce municipal codes and collect appropriate taxes. The economic costs Airbnb imposes likely outweigh the benefits. While the introduction and expansion of Airbnb into U.S. cities and cities around the world carries large potential economic benefits and costs, the costs to renters and local jurisdictions likely exceed the benefits to travelers and property owners. Airbnb might, as claimed, suppress the growth of travel accommodation costs, but these costs are not a first-order problem for American families. The largest and best-documented potential benefit of Airbnb expansion is the increased supply of travel accommodations, which could benefit travelers by making travel more affordable. There is evidence that Airbnb increases the supply of short-term travel accommodations and slightly lowers prices. But there is little evidence that the high price of travel accommodations is a pressing economic problem in the United States: The price of travel accommodations in the U.S. has not risen particularly fast in recent years, nor are travel costs a significant share of American family budgets. Because housing demand is relatively inelastic (people’s demand for somewhere to live doesn’t decline when prices increase), even small changes in housing supply (like those caused by converting long-term rental properties to Airbnb units) can cause significant price increases. High-quality studies indicate that Airbnb introduction and expansion in New York City, for example, may have raised average rents by nearly $400 annually for city residents. The rising cost of housing is a key problem for American families. 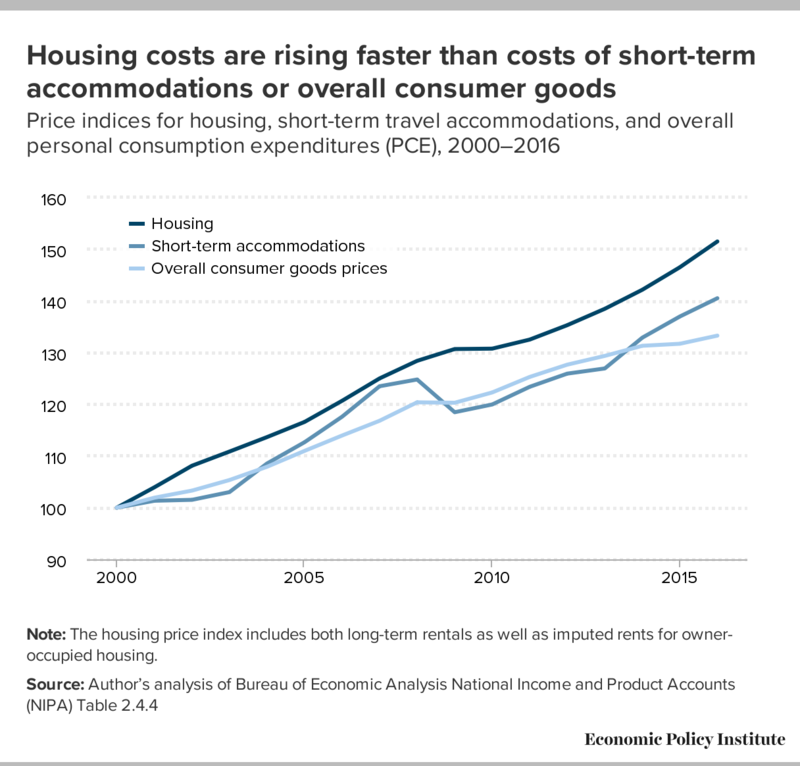 Housing costs have risen significantly faster than overall prices (and the price of short-term travel accommodations) since 2000, and housing accounts for a significant share (more than 15 percent) of overall household consumption expenditures. The potential benefit of increased tourism supporting city economies is much smaller than commonly advertised. There is little evidence that cities with an increasing supply of short-term Airbnb rental accommodations are seeing a large increase in travelers. Instead, accommodations supplied via Airbnb seem to be a nearly pure substitution for other forms of accommodation. Two surveys indicate that only 2 to 4 percent of those using Airbnb say that they would not have taken the trip were Airbnb rentals unavailable. Studies claiming that Airbnb is supporting a lot of economic activity often vastly overstate the effect because they fail to account for the fact that much of this spending would have been done anyway by travelers staying in hotels or other alternative accommodations absent the Airbnb option. Property owners do benefit from Airbnb’s capacity to lower the transaction costs of operating short-term rentals, but the beneficiaries are disproportionately white and high-wealth households. Wealth from property ownership is skewed, with higher-wealth and white households holding a disproportionate share of housing wealth overall—and an even more disproportionate share of housing wealth from nonprimary residences because they are much more likely to own nonprimary residential property (such as multi-unit Airbnb rentals). City residents likely suffer when Airbnb circumvents zoning laws that ban lodging businesses from residential neighborhoods. The status quo of zoning regulations in cities reflects a broad presumption that short-term travelers likely impose greater externalities on long-term residents than do other long-term residents. Externalities are economic costs that are borne by people not directly engaged in a transaction. In the case of neighbors on a street with short-term renters, externalities include noise and stress on neighborhood infrastructure like trash pickup. These externalities are why hotels are clustered away from residential areas. Many Airbnb rental units are in violation of local zoning regulations, and there is the strong possibility that these units are indeed imposing large costs on neighbors. Because Airbnb is clearly a business competing with hotel lodging, it should be subject to the same taxation regime as hotels. In regard to zoning regulations, there is no empirical evidence that the net benefits of Airbnb introduction and expansion are so large that policymakers should reverse long-standing regulatory decisions simply to accommodate the rise of a single company. Airbnb runs an online marketplace for short-term lodging rentals. It largely does not own dwellings or real estate of its own; instead, it collects fees by acting as a broker between those with dwellings to rent and those looking to book lodging. The key potential benefit is that property owners can diversify the potential streams of revenue they generate from owning homes. Say, for example, that before Airbnb arrived in a city, property owners setting up residential rental properties faced transaction costs so high that it only made economic sense to secure relatively long-term leases. These transaction costs incurred by property owners could include advertising for and screening of tenants and finding alternative accommodations for themselves if they were renting their own dwellings. But if the rise of internet-based service firms reduced these transaction costs and made short-term rentals logistically feasible and affordable for the first time, it could allow these property owners to diversify into short-term rentals as well as long-term rentals. Another potential benefit is the increased supply (and variety) of short-term rentals available to travelers. This increased supply can restrain price growth for short-term rentals and make traveling more affordable. Finally, one well-advertised potential benefit of Airbnb is the extra economic activity that might result if the rise of Airbnb spurs an increase in visitors to a city or town. Besides the income generated by Airbnb property owners, income might be generated by these visitors as they spend money at restaurants or in grocery stores or on other activities. Another large potential city-specific cost of Airbnb expansion is the loss of tax revenue. Many cities impose relatively steep taxes on short-term lodging, hoping to obtain revenue from out-of-town travelers to spend on local residents. The most common and straightforward of these revenue raisers is a tax on traditional hotel rooms. If Airbnb expansion comes at the expense of traditional hotels, and if the apparatus for collecting taxes from Airbnb or its hosts is less well-developed than the apparatus for collecting taxes from traditional hotels, this could harm city revenues. A further potential cost is the externalities that property rentals (of all kinds) impose on neighbors, for example, noise and/or use of building facilities. Since hosts are often not on-site with their renters, they do not bear the costs of these externalities and hence may not factor them into rental decisions. Of course, one could argue that such externalities are also incurred with long-term rentals not arranged through Airbnb. But if the expansion of Airbnb increases total short- and long-term rental activity, or if short-term rentals impose larger externalities than long-term rentals, then Airbnb expansion can increases these externalities. Finally, if Airbnb expansion comes at the expense of traditional hotels, it could have a negative impact on employment. First, since some of the labor of maintaining Airbnb lodgings is performed by the property owners themselves, the shift to Airbnb from traditional hotels would actually reduce employment overall. Second, since the task of cleaning and maintaining rooms and even greeting Airbnb renters is often done by third-party management firms, the shift from the traditional hotel sector to Airbnb rentals could degrade job quality. The rest of this report evaluates the potential scope of each of these benefits and costs, and ends with an overall assessment of the effect of Airbnb expansion. This section elaborates on the potential benefits identified in the previous section. For each benefit, it assesses how likely the benefit is to emerge, provides empirical estimates of the magnitude of the benefit, and discusses the likely distribution of the benefit. The most obvious benefit stemming from the creation and expansion of Airbnb accrues to property owners who have units to rent. Owners of residential property have essentially three options for earning a return on the property: They can live in the residence and hence not have to pay rent elsewhere, they can rent it out to long-term residents, or they can rent it out to short-term visitors. If the only barrier to renting out residential property to short-term visitors were the associated transaction costs, then in theory the creation and expansion of Airbnb could be reducing these transaction costs and making short-term rental options more viable. It does seem intuitive that transaction costs of screening and booking short-term renters would be higher over the course of a year than such costs for renting to long-term residents (or the costs of maintaining owner-occupied property). However, the potential benefits are only the difference between what the property owner earned before the introduction of Airbnb and what the property owners earned from short-term rentals booked through the Airbnb platform. These potential benefits are likely quite skewed to those with more wealth. While housing is more widely held than most other assets, the total value of housing wealth is (like all wealth) quite concentrated among white and high-income households. Further, because of the myriad benefits of owning one’s own residence, it is likely that much of the benefit of Airbnb’s introduction and expansion accrues to those with more than one property (one for occupying and one or more for renting).3 The distribution of property wealth generated by nonprimary residential real estate is even more concentrated than housing wealth overall. Figure A shows, by wealth class, the distribution of housing wealth overall and of housing wealth excluding owner-occupied housing. Note: Primary housing wealth is wealth from owner-occupied housing. Nonprimary housing wealth is wealth from nonowner-occupied housing. The wealth classes depicted overlap, with the top 20 percent broken down into households falling within the 80th to 90th, 90th to 95th, and 96th to 99th percentiles. This figure shows that the potential benefits of Airbnb introduction and expansion to property owners are highly concentrated. To put it simply, any economic occurrence that provides benefits proportional to owning property is one that will grant these benefits disproportionately to the wealthy. 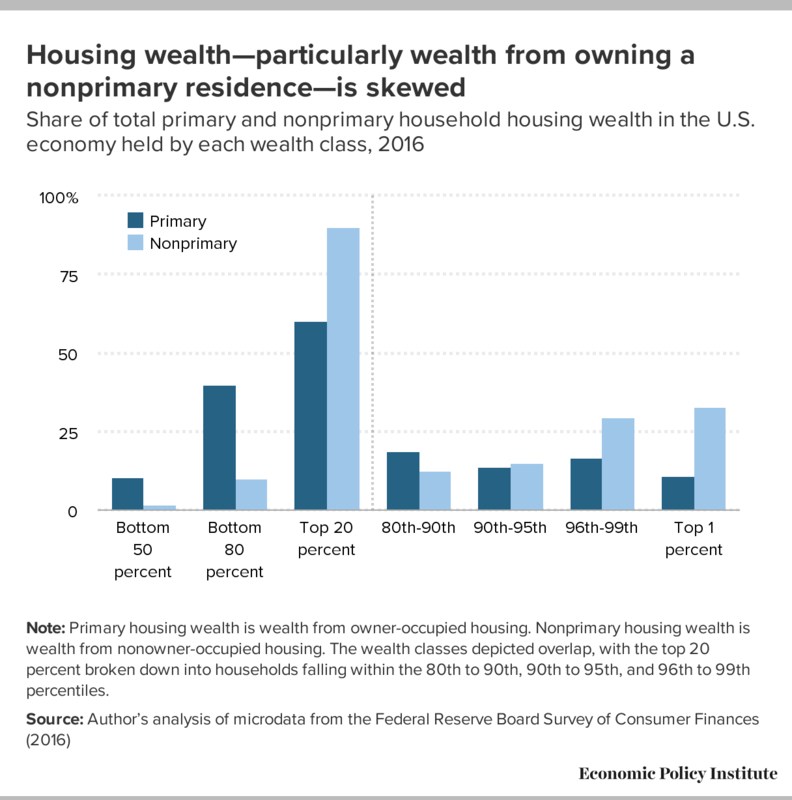 In 2016, for example, 60.0 percent of primary housing wealth (housing wealth in households’ primary residences) was held by the top 20 percent of households. (Not shown in the figure is that this share has increased by 5.4 percentage points since 1989.) As we noted earlier, however, many Airbnb listings are actually owned by households with multiple units to rent. Given this, Figure A also shows the share of housing wealth from nonprimary residences held by various groups. This “nonprimary housing wealth” is far more skewed. For example, the top 20 percent hold 90.1 percent of this type of wealth. 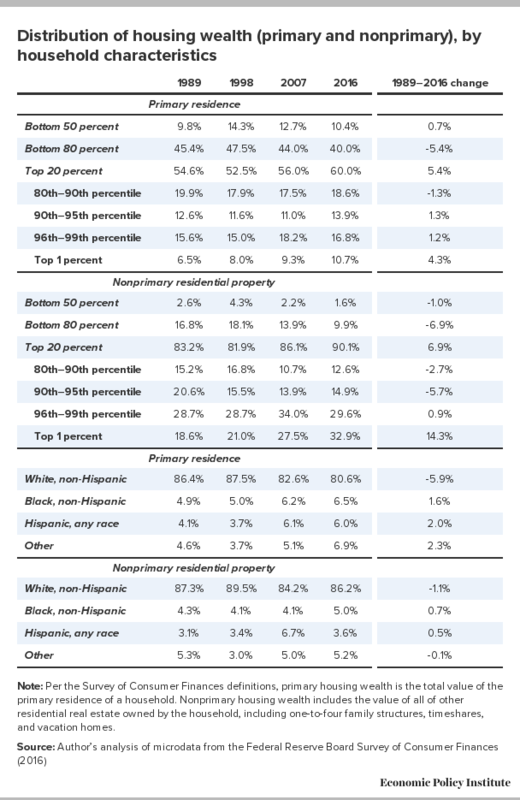 Figure B shows the distribution of housing wealth by race and ethnicity. Across racial groups, more than 80 percent of wealth in one’s primary residence was held by white households. African American households held just 6.5 percent of wealth in primary residences, Hispanic households held 6.0 percent of this type of wealth, while households of other races and ethnicities held 6.9 percent. Not shown is the change in the share of wealth in primary residences held by racial and ethnic groups: Primary housing wealth held by nonwhite households has risen a bit (by roughly 6 percentage points) since 1989. 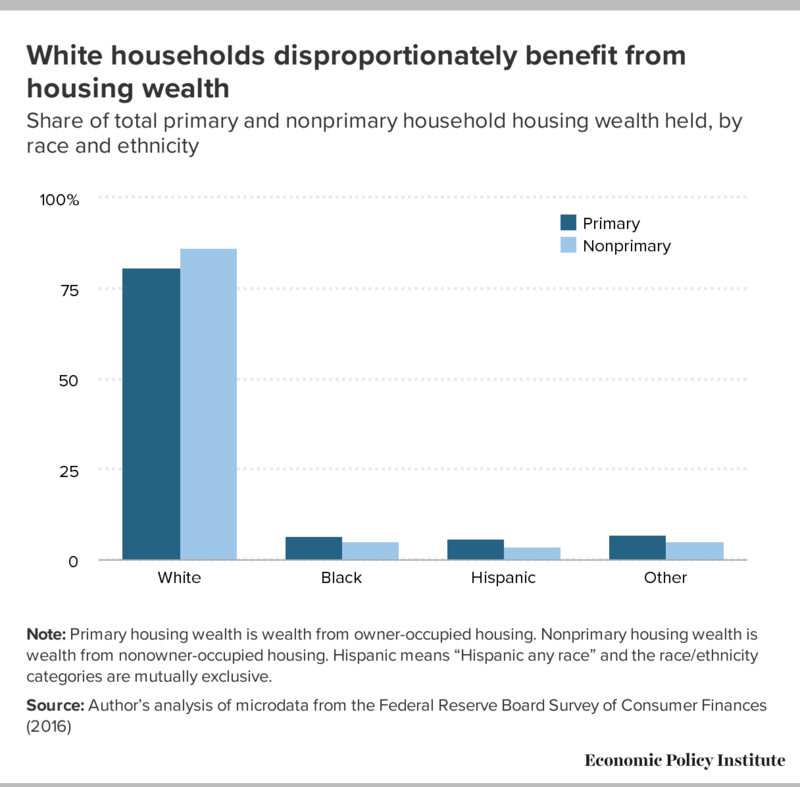 As with the distribution by wealth class, the holdings of nonprimary housing wealth by race and ethnicity are again even more skewed, with white households holding more than 86 percent of this type of wealth. African American households hold just 5.0 percent of nonprimary housing wealth, Hispanic households hold 3.6 percent, and households of other races and ethnicities hold 5.2 percent. Note: Primary housing wealth is wealth from owner-occupied housing. Nonprimary housing wealth is wealth from nonowner-occupied housing. Hispanic means “Hispanic any race” and the race/ethnicity categories are mutually exclusive. Finally, while Airbnb might make short-term rentals feasible for property owners by reducing transaction costs through the technological efficiencies provided by Airbnb’s internet-based platform, the company might also just make short-term rentals feasible by creating a norm of ignoring regulations that bar short-term rentals. Short-term rentals are effectively banned in many residential neighborhoods in the cities where Airbnb operates, yet they have proliferated after the introduction of Airbnb.4 The regulations barring or limiting short-term rentals were established to reduce the externalities associated with commercial operations of certain kinds—including hotel operations—in residential neighborhoods. Airbnb’s business model appears to depend significantly on skirting these regulations and dodging competition from traditional hotel owners who are prohibited from operating in these same neighborhoods. If the regulations banning short-term rentals are baseless and serve no useful purpose, then subverting them could be seen as a benefit of Airbnb. But allowing large corporations such as Airbnb to simply ignore regulations—rather than trying to change them through democratic processes—is hardly the basis of sound public policy. Airbnb is essentially a positive supply shock to short-term accommodations. Like all positive supply shocks, it should be expected to lower prices. There is some accumulating evidence that Airbnb does exactly this. Zervas, Proserpio, and Byers (2017) examine the effect of Airbnb expansion across cities in Texas. They find that each 10 percent increase in the size of the Airbnb market results in a 0.4 percent decrease in hotel room revenue. They find that most of this revenue decline is driven by price declines. Evidence of the positive supply shock is particularly evident in the 10 American cities where Airbnb’s presence is largest. Dogru, Mody, and Suess (2019) find a negative correlation between Airbnb expansion and hotels’ average daily rates in the 10 U.S. cities with the largest Airbnb presence. Besides cost, the introduction and expansion of Airbnb could improve the perceived quality of accommodations available. There is some limited evidence that this is the case: a survey by doctoral candidate Daniel Adams Guttentag (2016) finds that “convenient location” is one of the top reasons given by Airbnb guests when asked why they chose the service. But the Guttentag 2016 survey also identifies “low cost” as the single most-identified reason people give when asked why they chose Airbnb. However, it should be stressed that this potential benefit of Airbnb introduction and expansion is overwhelmingly a redistribution of welfare, not an increase in economywide welfare. Very few people have claimed that Airbnb’s spread within a given city has led developers to build more accommodations in the city overall. Instead, owners or third parties have often turned long-term rental units into short-term lodging via Airbnb. The question then becomes, “Has this redistribution of potential accommodations from the long-term to the short-term market increased economic welfare overall?” One way that Airbnb could be increasing economic welfare overall is if it were helping travelers deal with rising travel accommodation costs. Source: Author’s analysis of Bureau of Economic Analysis National Income and Product Accounts (NIPA) Table 2.4.4. The lower prices and greater range of options made available by the introduction and expansion of Airbnb could, in theory, induce a large increase in travel and spark economic growth in destination cities. This is precisely the claim made in a report by NERA Economic Consulting (NERA 2017), which says that Airbnb “supported” 730,000 jobs and $61 billion in output globally, with roughly a quarter of this economic gain occurring in the United States. To be blunt about these claims, they are flatly implausible. They rest on the assumption that all money spent by those renting Airbnb units is money that would not have been spent in some alternative accommodations had Airbnb not existed. Say, for example, that guests at Airbnb properties spent $10 million in New York City in 2016, including the money spent at restaurants and theaters and other attractions while visiting the city. The rental payment these guests make is included in the NERA numbers, but is expressed as extra income for Airbnb hosts. NERA then takes this entire $10 million in spending (both nonaccommodation spending by visitors and the extra income going to Airbnb hosts) and runs it through input–output models to generate multiplier effects that yield their final numbers for output and employment supported in each city. There are a number of problems with the NERA study. First, it is surprisingly opaque. It does not provide overall global and U.S. spending numbers or break these numbers into their components: nonaccommodation spending by Airbnb guests and income generated for Airbnb hosts. It also does not report the assumed size of the multiplier. Rather, it provides final numbers for global and U.S. output and employment that are functions of primary spending flows multiplied by the effects of their input–output model. The study states that it uses the well-known IMPLAN model, but IMPLAN can generate multipliers of varying size: It would be valuable to know just how large NERA is assuming the multiplier effects of this Airbnb-related spending is, just as a plausibility check. What is by far the most important weakness of the NERA analysis is its reliance on the assumption that all spending done by travelers staying at Airbnb properties is spending that would not have been done had Airbnb not existed. The possibility that Airbnb visitors would still have visited a city even if Airbnb units were unavailable—by securing alternative accommodations—is completely ruled out by the NERA analysis. This is obviously an incorrect assumption. For example, it assumes that Airbnb and traditional hotels are not seen as potential substitutes for each other in the minds of travelers. But research has shown that they are quite close substitutes. Zervas, Proserpio, and Byers (2017) empirically assess the effect of Airbnb’s expansion on the hotel industry in the state of Texas. In their introduction, they write, “Our hypothesis is that some stays with Airbnb serve as a substitute for certain hotel stays, thereby impacting hotel revenue….” In their discussions and conclusions section, they summarize what their empirical investigation has found: “Focusing on the case of Airbnb, a pioneer in shared accommodations, we estimate that its entry into the Texas market has had a quantifiable negative impact on local hotel room revenue.” Put simply, this result is completely inconsistent with the assumption that Airbnb has no potential substitutes for those using its services. This in turn means that at least some of the economic activity “supported” in local economies by spending done by Airbnb guests is activity that would have been supported absent Airbnb, likely by these same guests staying in traditional hotels or other accommodations. As discussed in a previous section, Guttentag (2016) reports the findings of a survey of Airbnb users. Among other questions, the survey explicitly asks how substitutable travelers find Airbnb lodgings. The precise question is, “Thinking about your most recent Airbnb stay—If Airbnb and other similar person-to-person paid accommodations services (e.g., VRBO) did not exist, what type of accommodation would you have most likely used?” Only 2 percent of Airbnb users responded to this question with the assertion that they would not have taken the trip. The remaining 98 percent identified other lodging possibilities that they would have used. In a similar survey that included some business travelers, Morgan Stanley Research 2017 reports near-identical findings, with between 2 and 4 percent of respondents saying that they would not have undertaken a trip but for the presence of Airbnb.7 In both the Morgan Stanley Research survey and the Guttentag survey, roughly three-fourths of the respondents indicated that Airbnb was substituting for a traditional hotel. If the Guttentag 2016 and Morgan Stanley Research 2017 findings are correct, this implies that NERA overstates the support Airbnb provides to local economies by somewhere between 96 and 98 percent. It is possible that some flows of spending might support more local spending when associated with Airbnb instead of traditional hotels—for example, one could argue that income accruing to Airbnb hosts is more likely to be spent locally than money paid to large hotel chains. However, the reverse is also true—for example, Airbnb rentals are far more likely to come equipped with a kitchen, and so Airbnb lodgers might be more likely to eat in rather than patronize restaurants. Additionally, the local spillover spending associated with Airbnb expansion might not be uniform across neighborhoods. Alyakoob and Rahman (2018) document a modest increase in local restaurant spending associated with expanding Airbnb presence. Essentially, restaurants located away from central hotel cores in cities are unlikely to attract many out-of-town tourists. But if Airbnb penetration in outlying neighborhoods increases, restaurants there might now be able to tap some of this tourist market. Alyakoob and Rahman find that every 2 percent rise in Airbnb activity in a given neighborhood increases restaurant employment in that neighborhood by 3 percent. Crucially, Alyakoob and Rahman make no such calculation for potential employment-depressing effects of restaurants closer to traditional hotels. Further, they find that the boost to restaurant employment given by greater Airbnb activity does not occur in areas with a relatively high share of African American residents. Finally, given that the overwhelming share of jobs “supported” by Airbnb are jobs that would have been supported by guests in some alternative accommodation, it seems likely that even if there is a slight increase in spending associated with a slight (about 2 percent) increase in visitors to a city due to Airbnb, there may well be a decline in jobs. We have noted previously that it is quite possible that traditional hotels are a more labor-intensive source of accommodation than are Airbnb listings. If, for example, Airbnb operators employ fewer people to provide cleaning and concierge and security services, then each dollar spent on Airbnb accommodations is likely to support less employment than each dollar spent on traditional hotel accommodations. Even if one grants that 2 to 4 percent of the output supported by Airbnb in host cities is net new spending, this spending is just a redistribution away from other, presumably less-Airbnb-intensive, localities. Given that Airbnb has tended to grow in already rich and desirable cities, it is unclear why inducing the transfer of even more economic activity away from other cities toward thriving cities would ever be viewed as a positive policy outcome. This section elaborates on the potential costs highlighted in the overview section. It assesses the likely outcome of these costs, estimates their empirical heft, and assesses the likely distribution of these costs. The mirror image of Airbnb’s positive supply shock to short-term travel accommodations is its negative supply shock to long-term housing options. Again, none of the literature reviewed in this paper suggests that the introduction and expansion of Airbnb has spurred more residential construction overall, so as more units become available to Airbnb customers, this means that fewer potential housing units are available to long-term renters or owner-occupiers in a city. 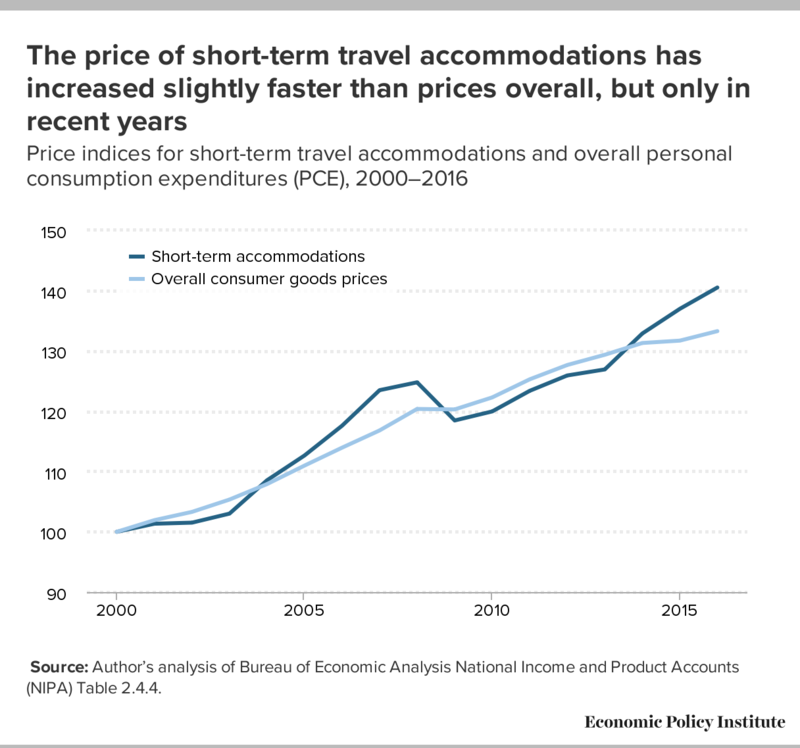 Earlier, we saw that price increases in short-term travel accommodations have been in line with overall consumer price increases in recent years, suggesting that there is no obvious shortage in short-term accommodations. (It is important to note that the tracking of short-term travel accommodation prices and overall prices was tight well before Airbnb was exerting any serious effect one way or the other on prices.) However, national prices of long-term housing are rising faster than overall prices, suggesting a shortage of long-term housing. Because of this above-inflation growth in long-term housing costs, any trend that exacerbates this increase is more damaging than if these prices had been relatively flat in recent years. Figure D shows inflation in the price indices for housing (long-term rentals as well as imputed rents for owner-occupied housing) and for short-term travel accommodations, and in the overall personal consumption expenditures index. In recent years, long-term housing price growth has clearly outpaced both overall price growth and increases in the price of short-term travel accommodations. This recent rise in the inflation rate of long-term housing, in fact, has become a much-discussed policy challenge that has spurred much commentary and analysis over the past decade. Note: The housing price index includes both long-term rentals as well as imputed rents for owner-occupied housing. The fact that the cost of long-term housing has become a prime source of economic stress for typical Americans should be considered when weighing the costs and benefits of Airbnb’s introduction and expansion. Crucially, demand for housing is quite inelastic, meaning that households have little ability to forgo housing when it becomes more expensive. When demand is inelastic, even relatively small changes in housing supply can cause significant changes in the cost of housing.10 This intuition is clearly validated in a number of careful empirical studies looking precisely at the effect of Airbnb introduction and expansion on housing costs. Barron, Kung, and Proserpio (2018) undertake a similar exercise with different data. They create a data set that combines Airbnb listings, home prices and rents from the online real estate firm Zillow, and time-varying ZIP code characteristics (like median household income and population) from the American Community Survey (ACS). To account for the fact that rents and Airbnb listings might move together even if there is no causal relationship (for example, if both are driven by the rising popularity of a given city), they construct an instrumental variable to identify the causal effect of rising Airbnb listings on rents. Using this instrument, they find that a 10 percent increase in Airbnb listings in a ZIP code leads to a 0.42 percent increase in ZIP code rental prices and a 0.76 percent increase in house prices. They also find that the increase in rents is larger in ZIP codes with a larger share of nonowner-occupied housing. Finally, like Merante and Horn, they find evidence that Airbnb listings are correlated with a rise in landlords shifting away from long-term and toward short-term rental operations. Wachsmuth et al. (2018) apply the regression results identified by Barron, Kung, and Proserpio (2018) to the large increase in Airbnb rentals in New York City. They find a 1.4 percent increase in NYC rents from 2015 to 2017 due to Airbnb’s expansion in that city. For the median NYC renter, this implies a $384 annual increase in rent from 2015 to 2017 due to Airbnb’s expansion over that time. For the localities making policy decisions regarding the expansion of Airbnb, perhaps the single biggest consideration is fiscal. Across the United States, total lodging taxes are significant: For the 150 largest cities, the all-in lodging tax rate (including state, county, and city taxes) averaged more than 13 percent (Hazinski, Davis, and Kremer 2018). The temptation for any given locality to set relatively high lodging tax rates (particularly when compared with overall sales tax rates) seems clear—city residents pay little of the lodging tax but still enjoy the benefits funded by the tax. For a number of cities, the total revenue collected is substantial. In 2016, for example, New York City and Las Vegas each collected well over $500 million in lodging taxes, and San Francisco collected just under $400 million. It seems odd to exclude Airbnb stays from the lodging tax, yet the tax treatment of Airbnb rentals is inconsistent and incomplete. The company has entered into a number of tax agreements with state and local governments and is clearly trying to build the impression that it wants to help these governments collect taxes. Yet a number of tax experts argue that Airbnb’s efforts to collect and remit lodging taxes (as well as other taxes) have been wholly insufficient. Airbnb, whose operations in some instances may violate traditional local zoning and rental ordinances, has sought to legitimize its business by negotiating agreements with cities under which it will collect local sales and lodging taxes. “Working together, platforms like Airbnb can help governments collect millions of dollars in hotel and tourist tax revenue at little cost to them,” the company stated in a “policy tool chest” it offered in late 2016. Overall, by Airbnb’s count, the company is collecting sales, hotel, or other taxes in 26 states and the District of Columbia (DC) as of March 1, 2017. State-level taxes are collected in 18 of those states. Among this group, some or all local-level taxes are also being collected in every state except Connecticut, which lacks local lodging taxes. In the remaining eight states, Airbnb collects a patchwork of local taxes but no state taxes. In three states—Alaska, Maryland, and New Jersey—Airbnb’s tax collection is limited to a single locality (Anchorage, Montgomery County, and Jersey City, respectively). The company has dramatically expanded its tax collection practices in recent years and appears poised to continue its expansion in the months and years ahead. Airbnb recently announced that it will soon begin collecting state lodging taxes in Maine, for instance. Dan Bucks, a former director of the Montana Department of Revenue and former executive director of the Multistate Tax Commission, wrote a report assessing the tax agreements that Airbnb has struck with state and local governments in different parts of the country. His central finding is that these agreements “[undermine] tax fairness, transparency, and the rule of law” (Bucks 2017). The most specific criticism Bucks makes is that these agreements have largely been kept secret from the public, in clear contrast to other “voluntary disclosure agreements.” This secrecy, combined with agreements to “cede substantial control of the payment and audit processes to Airbnb,” make it impossible for tax authorities to ensure proper payment of lodging taxes. Bucks also argues that these agreements between Airbnb and state and local governments provide large benefits to third parties (Airbnb hosts) who are not signatories and are not obligated to provide anything in exchange for these benefits. In 2016, an analysis from AlltheRooms.com forecast that Airbnb’s failure to ensure the full payment of lodging taxes was on track to cost subnational governments a combined $440 million in revenue unless policymakers moved to guarantee proper payment. Of the total, $110 million in lost revenue was for New York City alone. In October 2016, shortly after the AlltheRooms.com analysis was released, New York City passed restrictions on Airbnb advertisements for rentals of less than 30 days when an owner is not present. While these restrictions may have stemmed the loss of revenue relative to the AlltheRooms.com projection, the analysis that predated the restrictions highlight how the unregulated expansion of Airbnb, and its cannibalization of traditional hotel business market share, could still have large fiscal implications for New York and other cities. Finally, even if Airbnb were to fully comply with the local jurisdiction’s tax system on lodgings and pay the same tax rate per dollar earned as traditional hotels, there likely would still be some small fiscal losses stemming from Airbnb’s expansion. The primary appeal of Airbnb to most travelers is lower-price accommodations, so even if the same tax rate were paid on Airbnb rentals as is paid on hotel rooms, the lower Airbnb prices would lead to less tax revenue accruing to local governments. When owners do not reside in their residential property, this can lead to externalities imposed on the property’s neighbors. If absentee owners, for example, do not face the cost of noise or stress on the neighborhood’s infrastructure (capacity for garbage pickup, for example), then they will have less incentive to make sure that their renters are respectful of neighbors or to prevent an excessive number of people from occupying their property. The potential for such externalities has been broadly recognized for a long time and was a consideration leading to the prevalence of zoning laws that ban short-term travel accommodations in residential neighborhoods. There is a reason, for example, why Times Square in New York City is a cluster of hotels while the Upper East Side is largely a less noisy cluster of residential dwellings. There is of course no reason why such past zoning decisions need to be completely sacrosanct and never changed, but these decisions were made for a reason, and changes to them should be subject to democratic debate. While researchers have often noted the possibility that Airbnb may impose externalities on the communities surrounding Airbnb units, we know of no empirical estimates of these externalities. If these externalities were powerful enough in degrading the desirability of neighborhoods, they could in theory lead to reduced rents and home prices. From the evidence of the previous section, we know that Airbnb adoption in neighborhoods has actually boosted rental and home prices. But this price boost doesn’t mean these externalities don’t exist—it simply means that price-depressing externalities are offset by the supply effect of moving properties out of the long-term rental market. Miller (2016) makes an interesting (if likely too abstract) policy proposal for dealing with the externalities associated with home rental via Airbnb. He proposes creating a market in “transferable sharing rights,” in which, for example, each resident of a neighborhood would be given the right to rent out one housing unit for one night. Most residents in a neighborhood won’t want to rent out their home. But those who do want to rent out units using Airbnb would want far more than the right to rent out these properties for just one night. To obtain the right to rent out their properties for more nights, they would need to purchase permits from their neighbors. The price it takes to obtain these permits would provide a good indicator of the true costs of the externalities imposed by Airbnb. A city that experimented with these tradeable sharing rights could provide very useful information. We have noted already that when Airbnb enters and expands in a city, it shifts traveler business from hotels to Airbnb, leading to downward price pressure for hotels. This shift from traditional hotels to Airbnb properties also implies either a shift in jobs or a reduction in jobs. As an example, take hotel cleaning workers. As more visitors to a city pick Airbnb units over traditional hotel accommodations, the need for cleaning doesn’t go away. Instead, it is either foisted on Airbnb proprietors, done by third-party cleaning services, or left unmet and thus implicitly imposing costs on both travelers and the surrounding neighborhood (think of improperly disposed-of trash). This potential for Airbnb to degrade the quality of cleaning jobs is recognized even by the company itself: Airbnb offers hosts the opportunity to advertise that they have taken the “living wage pledge” by committing to pay a living wage to the cleaners and servicers of their properties. It is not clear how commitment to this pledge is (or can be) enforced, however. The current policy debates sparked by the rise of Airbnb have largely concerned tax collections and the emergence of “mini hotels” in residential neighborhoods. At its inception, Airbnb advertised itself as a way for homeowners (or long-term renters) to rent out a room in their primary residence, or as a way for people to rent out their dwellings for short periods while they themselves are traveling. However, in recent years Airbnb listings and revenues have become dominated by “multi-unit” renters—absentee property owners with multiple dwellings who are essentially running small-scale lodging companies on an ongoing basis. While there are plenty of other considerations, the spread of Airbnb seems at its core to be a shift of potential housing supply from the long-term residential housing market to the market for short-term accommodations. This shift of supply can lower prices for travelers but raise housing prices for long-term residents. This seems like a bad trade-off, simply based on the share of long-term housing expenses versus short-term travel expenses in average family budgets. Figure E presents the share of total personal consumption expenditures accounted for by housing and by short-term travel accommodations. 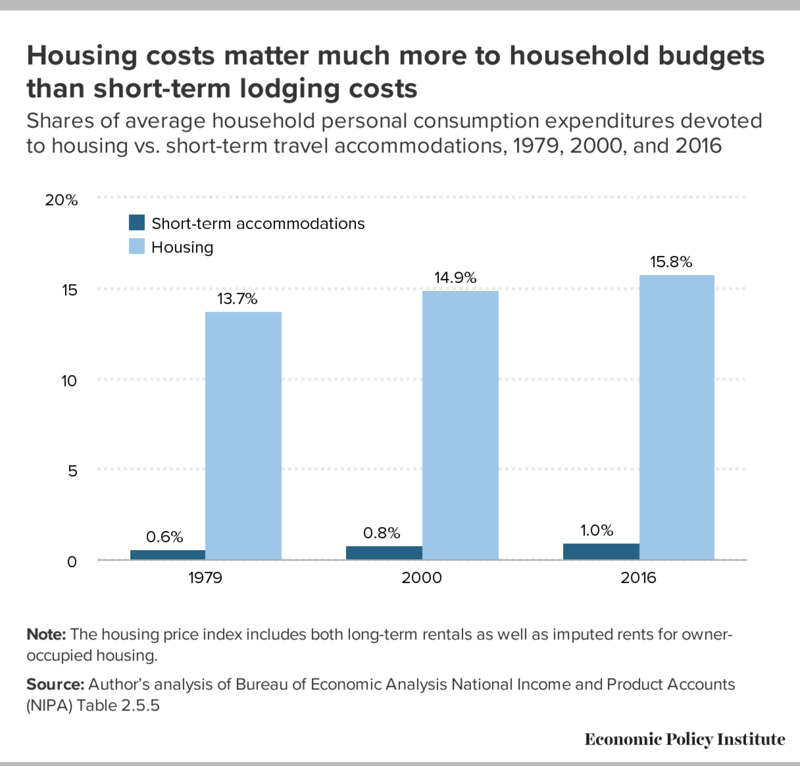 As the figure shows, housing costs eat up far more of the average household’s budget, and rising housing prices mean that long-term housing has grown more as a share of family budgets than short-term travel accommodations. This rising cost of housing has become a major economic stress for many American households. Anything that threatens to exacerbate this stress should face close scrutiny. A reasonable reading of the available evidence suggests that the costs imposed on renters’ budgets by Airbnb expansion substantially exceed the benefits to travelers. It is far from clear that any other benefits stemming from the expansion of Airbnb could swamp the costs it imposes on renters’ budgets. There may be plenty wrong with the status quo in cities’ zoning decisions. But the proper way to improve local zoning laws is not to simply let well-funded corporations ignore the status quo and do what they want. As this report shows, there is little evidence that the net benefit of accelerated Airbnb expansion is large enough to justify overturning previous considerations that led to the regulatory status quo—in fact, the costs of further Airbnb expansion seem likely to be at least as large, if not larger, than the benefits. Josh Bivens joined the Economic Policy Institute in 2002 and is currently EPI’s director of research. His primary areas of research include mac­roeconomics, social insurance, and globalization. He has authored or co-authored three books (including The State of Working America, 12th Edition) while working at EPI, has edited another, and has written numerous research papers, including for academic journals. He appears often in media outlets to offer eco­nomic commentary and has testified several times before the U.S. Congress. He earned his Ph.D. from The New School for Social Research. Note: Per the Survey of Consumer Finances definitions, primary housing wealth is the total value of the primary residence of a household. Nonprimary housing wealth includes the value of all of other residential real estate owned by the household, including one-to-four family structures, timeshares, and vacation homes. 1. According to a recent report, “a significant—and rapidly growing—portion of Airbnb’s revenue in major U.S. cities is driven by commercial operators who rent out more than one residential property to short-term visitors” (CBRE 2017). 2. Horton and Zeckhauser (2016) provide a deep dive into the economics of internet-based service firms. Slee (2017) provides an excellent popularization of some of the economic issues surrounding IBSFs from a deeply critical perspective. 3. The most obvious benefit to living in housing that one owns is the tax treatment of mortgage interest payments on owner-occupied property, which can be deducted from federal taxes. Another benefit is that the implicit rental income earned by owner-occupiers is not taxed (the money that owner-occupiers are saving by not having to pay rent elsewhere could be viewed as implicit rental income). 4. Wachsmuth et al. (2018), for example, find that just under half of Airbnb listings in New York City had likely taken illegal reservations. 5. “Arrivals” is a term referring to each stay in a unit, regardless of length of stay. 6. For example, Molla (2017) highlights more recent forecasts for 2017 indicating a large slowdown in U.S. Airbnb expansion. 7. The range of 2 to 4 percent represents the range of findings across 2015, 2016, and 2017. The value was 4 percent in 2015, 2 percent in 2016, and 3 percent in 2017. 8. The arithmetic on this is relatively straightforward. The NERA 2017 study asserts that Airbnb supports $14 billion in spending and 130,000 jobs in the United States. This implies each $107,690 supports a job. Say that half of this spending is the direct cost of accommodations and that it represents a pure expenditure shift away from traditional hotels. Assume further that traditional hotels are 5 percent more labor-intensive—so each traditional hotel job is supported by $102,300 in spending (5 percent less than the ratio identified by Airbnb). This shift from traditional hotels to Airbnb hence reduces employment by 3,400 jobs for each $7 billion in spending. Even if overall spending were to rise by 2 percent due to Airbnb’s expansion, this would increase employment by only roughly 2,600 jobs. The key insight here is that once one allows Airbnb to substitute for other forms of accommodation, the link between output and employment might change significantly. 9. Airbnb itself has commissioned and reported on a number of studies claiming that the share of guests who would not have taken the trip absent Airbnb is as high as 30 percent. Even this number is far larger than the independent assessments of Guttentag (2016) and Morgan Stanley Research (2017), but it does highlight just how outlandish the NERA assumption on this is. 11. The geographic unit implicitly being examined by Sheppard and Udell (2018) is not intuitive. Their observation is an individual home sale. They then track Airbnb listings within five different radii of the sale: 150, 300, 500, 1,000, and 2,000 meters. They interact the number of Airbnb listings with categorical variables for each of the five “buffer zones” defined by the radii and use this as an explanatory variable predicting sales prices. 12. See Office of New York State Attorney General 2014. 13. Lawler (2014) notes that Airbnb was testing out dedicated cleaning services for its hosts as early as 2014. 14. Unionization rates derive from the author’s analysis of data pooled from 2008–2017 from the Outgoing Rotation Groups (ORG) of the Current Population Survey (CPS). Code and results are available upon request. The 10 cities are Boston, Chicago, Los Angeles, Las Vegas, Miami, New York City, San Diego, San Francisco, Seattle, and Washington, D.C. In these 10 cities, the unionization rate for maids and cleaners was 23.2 percent in the traveler accommodation industry, but 12.1 percent in all other industries. 15. See Weil 2017 for an overview of labor market fissuring. Albouy, David, Gabriel Ehrlich, and Yingyi Liu. 2016. “Housing Demand, Cost-of-Living Inequality, and the Affordability Crisis.” National Bureau of Economic Research (NBER) Working Paper no. 22816, November 2016. AllTheRooms.com. 2016. Vacation Rental Market Analysis: 440 Million Reasons to Tax Airbnb Vacation Rentals, October 2016. Alyakoob, Mohammed, and Mohammed Saifur Rahman. 2018. “Shared Prosperity (or Lack Thereof) in the Sharing Economy.” Purdue University working paper, May 2018. http://dx.doi.org/10.2139/ssrn.3180278. Associated Press (AP). 2019. “Question from Washington on Oct. 11, 2016” (search result for “sharing economy”). AP Stylebook subscription-based website, accessed January 4, 2019. Barron, Kyle, Edward Kung, and Davide Proserpio. 2018. “The Sharing Economy and Housing Affordability: Evidence from Airbnb.” Working paper, March 2018. Bucks, Dan R. 2017. Airbnb Agreements with State and Local Tax Agencies: A Formula for Undermining Tax Fairness, Transparency and the Rule of Law. March 2017. Bureau of Economic Analysis. Various years. National Income and Product Accounts (NIPA), Tables 2.4.4 and 2.5.5. Accessed September 2018. CBRE Hotels’ Americas Research (CBRE). 2017. Hosts with Multiple Units—A Key Driver of Airbnb Growth: A Comprehensive National Review Including a Spotlight on 13 U.S. Markets. March 2017. Dogru, Tarik, Mararand Mody, and Courtney Suess. 2019. “Adding Evidence to the Debate: Quantifying Airbnb’s Disruptive Impact on Ten Key Hotel Markets.” Tourism Management, forthcoming June 2019. Dube, Arindrajit, and Ethan Kaplan. 2010. “Does Outsourcing Reduce Wages in Low-Wage Service Occupations? Evidence from Janitors and Guards.” Industrial and Labor Relations Review 63, no. 2: 287–306. Federal Reserve Board. 2016. Survey of Consumer Finances microdata. Accessed August 2018. Goldschmidt, Deborah, and Johannes Schmieder. 2017. “The Rise of Domestic Outsourcing and the Evolution of the German Wage Structure.” Quarterly Journal of Economics 132, no. 3: 1165–1217. http://doi.org/10.1093/qje/qjx008. Guttentag, Daniel Adams. 2016. “Why Tourists Choose Airbnb: A Motivation-Based Segmentation Study Underpinned by Innovation Concepts.” PhD diss., University of Waterloo. Hazinski, Thomas, Anthony Davis, and Daniel Kremer. 2018. 2018 HVS Lodging Tax Report – USA. HVS Convention, Sports, and Entertainment Consulting, September 2018. Horton, John, and Richard Zeckhauser. 2016. “Owning, Using and Renting: Some Simple Economics of the ‘Sharing Economy.’” National Bureau of Economic Research Working Paper no. 22029, February 2016. Lawler, Ryan. 2014. “Airbnb Is Testing Out an Affordable Cleaning Service for Hosts in San Francisco.” Techcrunch.com. Merante, Mark, and Keren Mertens Horn. 2016. “Is Home Sharing Driving Up Rents? Evidence from Airbnb in Boston.” University of Massachusetts Boston Department of Economics Working Paper no. 2016-03. Miller, Stephen. 2016. “First Principles for Regulating the Sharing Economy.” Harvard Journal on Legislation 53: 149–202. Molla, Rani. 2017. “Airbnb Is On Track to Rack Up More Than 100 Million Stays This Year—and That’s Only the Beginning of Its Threat to the Hotel Industry: As Long as Regulation Doesn’t Stop It, That Is.” Recode, July 19, 2017. Morgan Stanley Research. 2017. Surprising Airbnb Adoption Slowdown in US/EU, and What It Means for Hotels and OTAs. Report on Global Insight AlphaWise survey, November 2017. NERA Economic Consulting (NERA). 2017. Airbnb’s Global Support to Local Economies: Output and Employment. Prepared for Airbnb, March 2017. Office of New York State Attorney General. 2014. Airbnb in the City. Prepared by the Office of the Attorney General of the State of New York’s Research Department and Internet Bureau, October 2014. Schiller, Zach, and Carl Davis. 2017. Taxes and the On-Demand Economy. Institute on Taxation and Economic Policy, March 2017. Sheppard, Stephen, and Andrew Udell. 2018. “Do Airbnb Properties Affect House Prices?” Williams University working paper, January 2018. Slee, Tom. 2017. What’s Yours Is Mine: Against the Sharing Economy. New York: OR Books. Wachsmuth, David, David Chaney, Danielle Kerrigan, Andrea Shillolo, and Robin Basalaev-Binder. 2018. The High Cost of Short-Term Rentals in New York City. Urban Politics and Governance research group, School of Urban Planning, McGill University, January 2018. Weil, David. 2017. The Fissured Workplace: Why Work Became So Bad for So Many and What Can Be Done to Improve It. Cambridge, Mass. : Harvard Univ. Press. Zervas, Georgios, Davide Proserpio, and John W. Byers. 2017. “The Rise of the Sharing Economy: Estimating the Impact of Airbnb on the Hotel Industry.” Journal of Marketing Research 54, no. 5: 687–705. This report was updated March 26, 2019, to correct errors in the “Bottom 50 percent” rows in Appendix Table 1. These rows had incorrectly shown the numbers for the top 50 percent instead of for the bottom 50 percent.